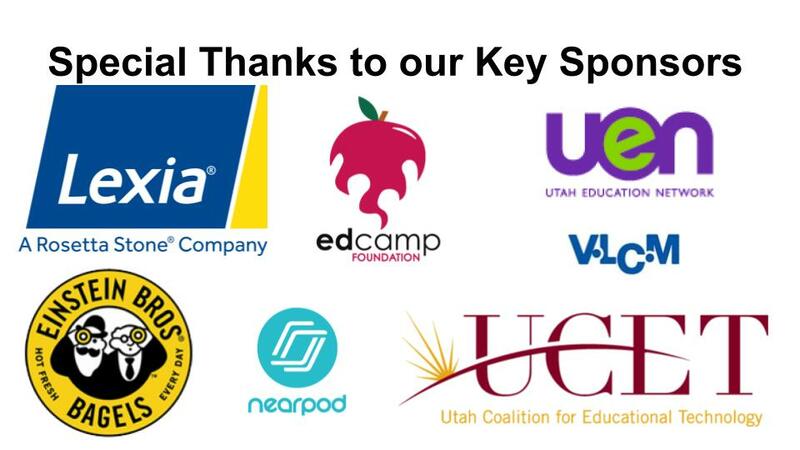 Thanks to everyone who helped make Edcamp Utah 2018 a huge success! A huge shoutout goes to our friends at The McGillis School for providing our wonderful venue! Hosted by any organization or individual:Anyone should be able to host an Edcamp. School districts, educational stakeholders and teams of teachers can host Edcamps. Reliant on the “law of two feet” which encourages participants to find a session that meets their needs: As anyone can host a session, it is critical that participants are encouraged to actively self-select the best content and sessions. Edcampers should leave sessions that do not meet their needs. This provides a uniquely effective way of “weeding out” sessions that are not based on appropriate research or not delivered in an engaging format. Despite the concrete definition, it can be difficult to truly capture the Edcamp experience. That’s because a “typical” day of learning at an Edcamp doesn’t really exist. Each Edcamp is unique and based on the needs of the participants. When you arrive at the location (usually a school or university) on the day of the event, there is no pre-set schedule of sessions or presenters. Instead, there’s just a blank sheet of big paper with a grid on it. From that blank slate, everyone builds the session schedule together. As people mingle and chat over free coffee and donuts, they put up potential discussion topics on a board. Since it’s my job to build the schedule at the Edcamp events I organize, I can truly attest that the entire process is positive and organic. Occasionally, people who don’t even know each other realize that they have similar interests and end up running a session together. Other folks come with an idea, throw it out to the group, revise it, and end up posting it with a refined focus. Since anyone who attends an Edcamp event can be a presenter at the event, it’s a very empowering experience for everyone involved. The skeptics are likely wondering, “What do you do if no ones signs up?” (I get that question a lot.) And while there are certainly specific strategies you can use to ease your anxiety (building an idea board on the event page, having conversations with amazing educators who are planning to attend, etc. ), they usually aren’t needed. I’ve never attended an Edcamp or heard of an Edcamp where the schedule board didn’t fill. It just doesn’t happen.